Fortunately for you, increasing the fiber content of your diet doesn’t mean that you’ll be forced to sit around gnawing on stuff that tastes like cardboard all day. And, also good to know…you won’t need any more time in the kitchen than that spent by those who aren’t concerned with increasing their fiber levels. In fact, a diet high in fiber can be convenient and tasty – as easy a bowl of bran cereal topped with berries…or as exotic as, say, conchiglie with artichoke sauce, a simple pasta recipe that contains nearly 20 grams of fiber in one serving. There are no limitations. Many experts will agree that a proper diet takes into account calories, balanced nutrition, vitamins, avoidance of dangerous foods such as saturated fats, and attention to all sources of dietary fiber from fruit, vegetables, whole grains and nuts and even seeds. Under the less-trendy term “roughage”, fiber enjoyed high praise among our grandparents. During the 1970s its importance was once again trumpeted by British physician Dennis Burkett, who practiced for many years in rural Africa. He attributed the rarity of illnesses such as hernias, hemorrhoids, diabetes, diverticulitis (small outpunchings of the large intestine), heart disease and bowel disease in that area to native diets which were rich in whole grains, seeds, roots, vegetables and nuts. He blamed the high incidence of these disorders in Western countries on a lack of adequate dietary fiber. His assertions resulted in a new life for fiber, massive promotion of bran cereals, and the oat bran craze. Then there was a long silence. Fiber took a back seat. Now, however…recent studies are bringing the benefits of fiber back to the forefront. Realizing the benefits of this essential nutrient, the American FDA has permitted product labels to carry health claims that oatmeal and oat cereals may reduce the risk of heart disease – as part of a diet low in fat and cholesterol. But high fiber isn’t just limited to oats any more. 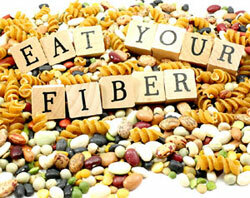 Those looking to begin a healthy diet rich in fiber are encouraged to get their daily dose from a variety of sources. And don’t worry, there are plenty to choose from.